Today is Star Wars day. I think next to my husband's birthday it has to be his favorite day. 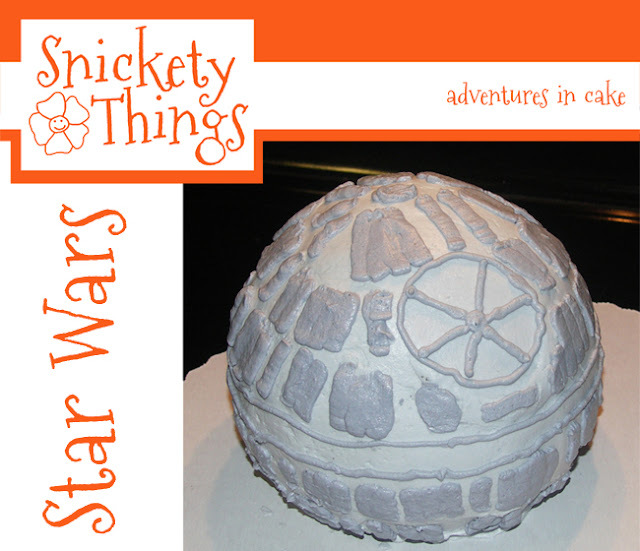 Due to him and my niece, who is also a fan, I have made a lot of little things Star Wars related. Did you see the present I gave my niece? I wrapped it to look like a lightsaber and it was filled with Hershey kisses that were also Star Wars themed. More recently I posted about the Death Star cake I made for my husband's birthday. 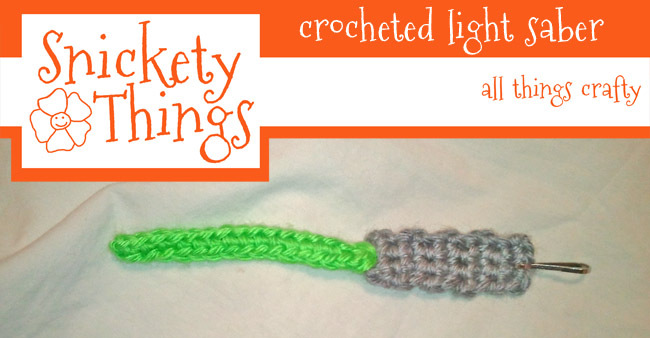 Well, I also made my niece another lightsaber, but this one was a crocheted zipper pull. I am happy to offer you the pattern. I used Caron Simply Soft yarn in Heather (color 1) and Limelight (color 2) and a size H hook. With color 1 Chain 5. Row 2: Sc in second ch from hook, sc in each ch back to handle, sl st to third sc in handle, work in tails. Add your zipper pull or whatever hardware you want. Please let me know how this pattern works for you if you try it. I love the crochet light saber! And now the men dressed up like Star Wars characters at the restaurant we went to tonight makes sense! I usually forget what day it is until it is almost over. This year I planned ahead. Too sweet, so are you for sharing the pattern. My nephew's birthday is the same day as Star Wars Day. My sister posted on FB about it, or I would have never known. Pretty funny. I like all of your SW creations. Thank you! Usually it sneaks up on me, but this year I remembered in time to make a blog post about it. Oh, this is too good! Thanks for sharing with us! I got married this Star Wars day! It almost guarantees neither of us will forget an anniversary! Great crafts too! Congratulations and May the Fourth, I mean Force, always be with you! I can't figure this pattern out! :( I follow the directions for the handle and end up with a rectangle...what am I missing? Where/how do you make it round? If it is a rectangle, you are doing it right. It isn't supposed to be round, the entire piece is flat. oh, it looks round. can you give me the dimensions (finished)? I gave it to my niece already, but the handle was just under a quarter inch wide and it was between 2-3 inches long. the blade was around an eighth of an inch wide. Thanks! :) I figured out why it looked funny. My stiches were wwaaaaayy too big. I used a smaller hook and its still bigger than what you have but it looks better. :D Yay! 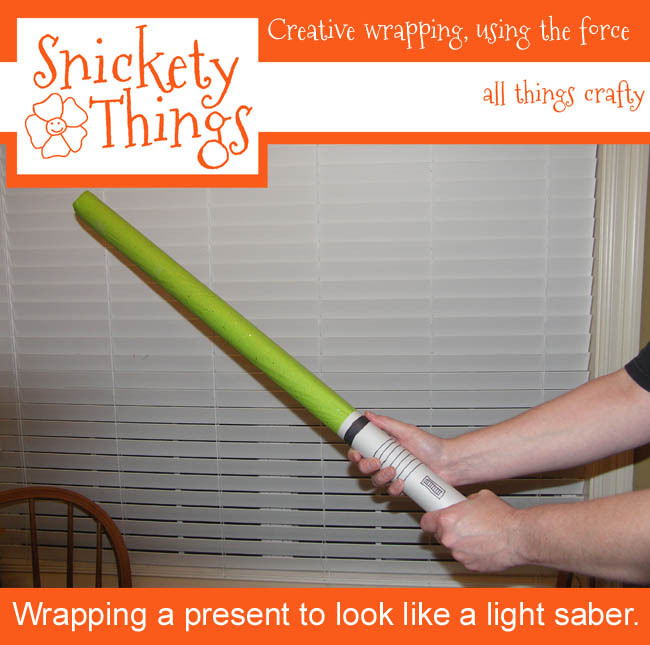 I have a lightsaber now!! I'm glad out worked for you!